Nearly 4 million elderly Americans who are frail, chronically ill, or homebound have limited or no access to primary care. Home-based primary care (HBPC)—the modern answer to house calls—offers a high-quality, cost-effective, and compassionate solution to addressing the needs of these individuals who otherwise might be left behind by our health care system. And nurse practitioners (NPs) are playing a growing role when it comes to HBPC, completing more house calls than any other provider type. Combining technical skills with a caring, can-do approach, NPs help make HBPC an experience that benefits patients and caregivers alike, while also achieving personal and professional satisfaction. 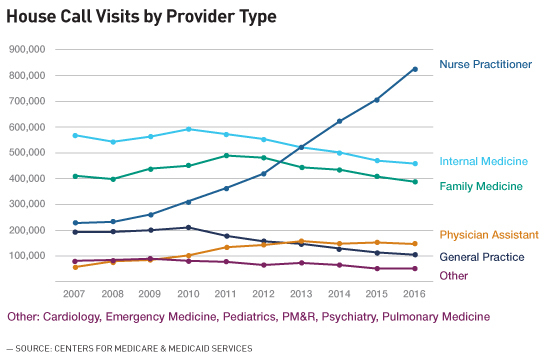 Data show that the number of NPs making house calls has soared in recent years, while the number of other types of providers making house calls has plateaued. In 2016, NPs completed more than 825,000 house calls—representing 40% of all house call visits that year and equal to the number of home visits by all internists and family medicine specialists combined. From my experience, this trend is not surprising, and it reflects the unique preparation that NPs bring to HBPC work. Out in the home, NPs simply get the job done, the same way that visiting nurses have for roughly 150 years. Performing technical and procedural skills such as blood draws, drain management, and wound care, as well as assessing patients to help make clinical diagnoses, are second nature to NPs. At the same time, they are well prepared to provide patient education, support caregivers and family members, and collaborate with a larger care team. NPs are committed to learning throughout their careers, and world-class training and educational opportunities are available to those who want to practice HBPC. After working as a nurse in clinical settings for 19 years, I made the shift two years ago from practicing hospital nursing to focusing on HBPC. Working in a fast-paced hospital setting taught me invaluable skills to diagnose and treat patients with acute conditions. But after mastering these tactical skills, I realized I craved deeper, more meaningful interactions with both my patients and their caregivers, as well as a less chaotic atmosphere. 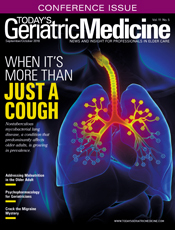 As an NP in a geriatric house-call program, I'm now able to take my skills into the field—where I'm needed most—to build connections with my patients and provide personalized, top-quality care. Our elders may be living with chronic diseases, but we can allow them to age in place with as little disruption as possible. As an NP, I believe working in patients' homes, where they are more comfortable and better able to make decisions about their medical care, is where I can make the biggest change in their quality of life. In the hospital, providers normally tell patients what to do, such as which medication to take and when, without always having a complete understanding of how the patient lives day to day. In patients' homes, I'm able to see how they really live—how they're eating, whether they're taking their medication, what kind of family and social support system they have. Having this 360-degree view allows me to more effectively collaborate with patients on their treatment goals and help address any obstacles. One recent obstacle I encountered involved a patient with heart failure who was struggling to take a prescribed diuretic because the medication made him urinate more often—an issue he revealed in a conversation during one of my regular house calls. In an office setting, a provider is more likely to think a patient will simply go home and comply with whatever they've prescribed. But the reality is somewhere in between patients complying fully and doing nothing. As a house-call NP—the consistent "boots on the ground"—I'm able to take the time to build trust with patients. In the case of my patient with heart failure, that trust allowed me to work with him on a compromise: having him take medication four times a week to start instead of every day. That not only decreased his immediate risk of decompensated heart failure and hospitalization but it also set me up to further negotiate during my next visit and improve his prognosis. As an HBPC provider, building meaningful relationships with patients is a unique privilege of my job. When I'm with a patient, it's not a social call; getting to know each other is an aspect of the visit. As a house-call NP, I'm often a patient's only visitor. Taking time to connect on a personal level—to talk about a trip I just took or hear a patient recount her granddaughter's birthday party—is deeply gratifying. Over time, having a detailed understanding of a patient's daily routine and personality can pay dividends in their treatment plan. For example, in one case, I got to know an elderly patient with dementia very well after several months of hands-on care and knew everything from how she took her coffee, to her love for her cat Sammy, to her affinity for wearing a favorite red hat. When her daughter and full-time caregiver decided to take a much-needed vacation, she only felt comfortable leaving her mother in hospice respite care temporarily because I was able to visit her mother and check on these nonmedical but still essential needs. Providing this type of support to caregivers is another benefit I enjoy as a house-call NP. Without caregivers, most individuals simply couldn't remain in the home, so building a close rapport with them and working toward the same goals is essential. NPs are especially well qualified to train, educate, and support caregivers, and in the field I can work with them directly to figure out what works and what doesn't. The flexibility and autonomy of working in the field vs an office setting is vital to my current effectiveness as an NP. Out in the community, I'm able to use my skills to effect greater change for my patients in real time, whether they require an urgent visit, follow-up care after being discharged from a hospital, or a scheduled check-up. Yet even within this nontraditional practice setting, I'm part of a larger care team and can immediately pull in other specialists and resources whenever necessary. As an HBPC practitioner, I use a good deal of tech in the home, including X-rays and ultrasounds, and I also apply my training and judgment to help diagnose patients while remaining connected to a larger team of experts. Because I see patients more often than I would in a clinical setting, I'm able to see changes in their health or behavior as those issues come up. HBPC is often provided through an integrated care team, and, as a house-call NP, I'm part of a larger network of specialists, including primary care providers, physician assistants, and social workers. Together, we take a collaborative approach to patient care. In some cases, my role in this process involves something straightforward, such as connecting patients with social workers because they have an urgent plumbing problem or no heat in the winter. Other times, it involves sorting out a potentially tricky medical problem and coming up with a care plan. This was the case recently when a patient's daughter/caregiver was distressed because her mother wouldn't eat, causing her glucose to drop drastically and exacerbating her dementia symptoms. Worried and unable to predict when the incidents would happen, the daughter called or requested visits from HBPC once a week on average. Working as a team, a doctor, a social worker, and I were able to fully assess and diagnose her mother's condition and give the daughter an action plan. We started by developing a written list of interventions that her daughter could implement in the home without feeling like she needed to call. Although the patient didn't have diabetes, the plan included having a glucometer in the home and educating the daughter on how to prompt her mother to eat—for example by putting a cereal bar or banana in her hand—if she wasn't feeding herself. This reassurance empowered her to take good care of her mother. Secondly, we developed a schedule of frequent "touches," by which the three of us contacted the daughter to check-in via phone or in-person through a home visit. Giving the daughter these simple tools and assuring her that she was doing an excellent job caring for her mother empowered her as a caregiver. Since we equipped her with an action plan, her mother has been stable with routine house call visits. As a house-call NP, I'm privileged to use my professional and personal skills to serve America's at-risk elderly population. Building relationships with my patients and their caregivers and working in a self-directed atmosphere within a larger network of specialists allows me to provide compassionate, high-quality care to those who need it most. As the demand for HBPC continues to grow, so does the need for HBPC-trained NPs. The Home Centered Care Institute (HCCI) is committed to educating and empowering NPs to meet this demand by offering the first and only comprehensive national education program that trains NPs on HBPC. To learn more about HBPC or HCCI's educational offerings, visit www.hccinstitute.org/housecalltraining. — Michael J. Kingan, DNP, AGPCNP-BC, CWOCN, is an adult-geriatric nurse practitioner at MedStar Health in Baltimore. He's been a nurse for 21 years and a home-based primary care provider for two years.